Copyright, Niels V. Christensen, Jan-2018. All the astronomical pictures shown on these pages have been taken from my garden located less than 10 km from the city center of Copenhagen Denmark. 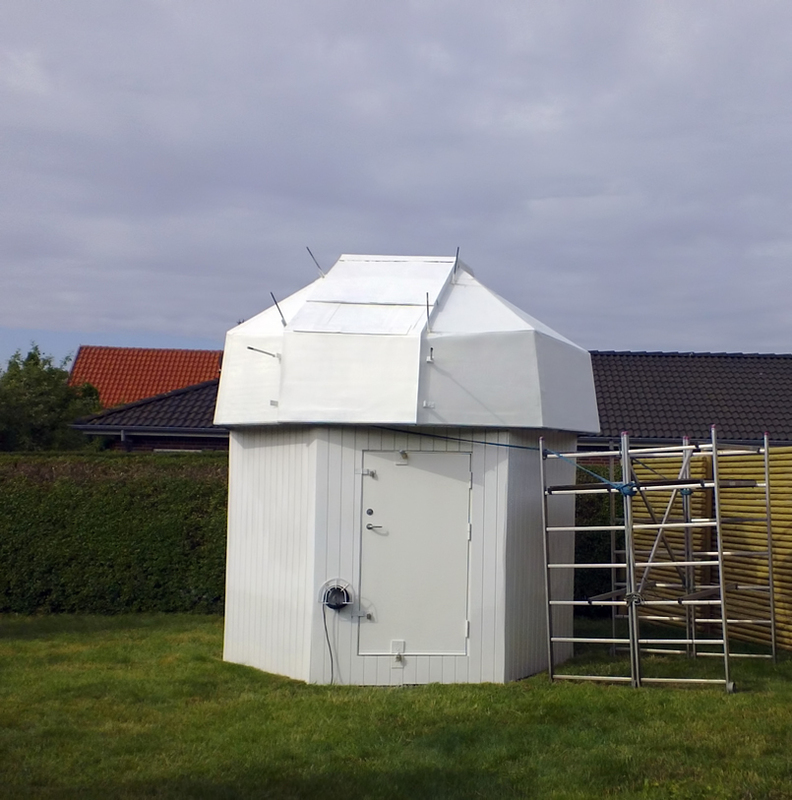 The homebuild observatory was constructed during 2005->2006. E-mails to reach me are: nvcchr@mail.dk, nielsv@astro-hp.dk or via nvcchr90@gmail.com, nielsnvc123@yahoo.com. Copyright, please note that all pictures are copyrighted to Niels V. Christensen, if not otherwise stated. Any content on this website must not be reproduced without the author's permission. The observatory contains three telescopes and five cameras. In order to control the astronomical sessions during the observation nights three PCs are used to control the scope tracking and take the raw images. The web pages on this site is still under construction meaning a lot of technical details about the different gallery pictures are still missing, but even so please feel free to explore the gallery pages. Until now more than 90 pictures are available, enjoy. 3. Jan-18, copyright date updated. 9. Jan-17, my Astro Gallery updated with new pictures. 29. June-16, My Astro Gallery page added as a trial. 23. Febr-15, TP cooperation picture added. 21. and 14. Dec-2014, tadpoles of IC410 pictures added. 21. Sep-2014, 2 Bubble Nebula pictures added. 29. Aug-2014, a Bubble Nebula LHaOIII,RHa,GOIII,BOIII picture added. 24. Aug-2014, Comet Jacques pictures added. 9/16. Aug-2014, Bubble Nebula, 88min. 2 LumHa pictures added. 6. Aug-2014, Cocoon Nebula, a 9,1 hours 2LHa-RHaSII,GOIII,BOIII picture added, 2 versions. 19-22.July-2014, Cocoon Nebula LHa-LRHaGB/WF pictures added. and now been chosen as S&T Editor's Choice Archive picture. 30. March-2014, M97 owl nebula pictures added. 23. Febr-2014, new processing attempt added on Merope IC349. 12. Jan-2014, my yahoo e-mail address added above. 13. Oct-2013, a re-processed picture of M45, Merope IC349 added. 12. Oct-2013, mixed picture of M45 added. 29. Sep-2013 and 1. Oct-2013, M45, Merope IC349 picture added. 26. Sep-2013, Selected Images section updated. 16. Sep-2013, M45 picture added. 6-8-11-13-14-15. Sep-2013, M76/M27 LHaOIIIRGB pictures added. 4. Sep-2013, Albireo variants and a not finalized M76 picture added. 31. Aug-2013, more menus added. 30. Aug-2013, M27 close-up color picture added. 29. Aug-2013, M31 Andromeda center picture added. 29. Aug-2013, M27 collage picture added and one WF picture. 25. Aug-2013, gallery pages updated with three pictures of Abireo.